Tweezerman knows you want to put your best face forward this spring, and every season. With the introduction of their newest skincare tools, you can have a brighter, clearer complexion without stepping foot into a spa. I love DIY beauty products so I can have a pamper session any day of the week! Complexion Cleansing Brush | This ergonomic brush features fine, silky soft synthetic bristles that gently cleanse skin for a deep down clean. With the addition of your favorite cleanser it removes makeup and impurities in one easy step. It even comes with a cover that has ventilation holes so it can thoroughly dry while staying clean and maintaining its shape. I love how soft this brush is and it's really comfortable to hold. This will be perfect for travel and I don't have to worry about bringing a device that needs charging! 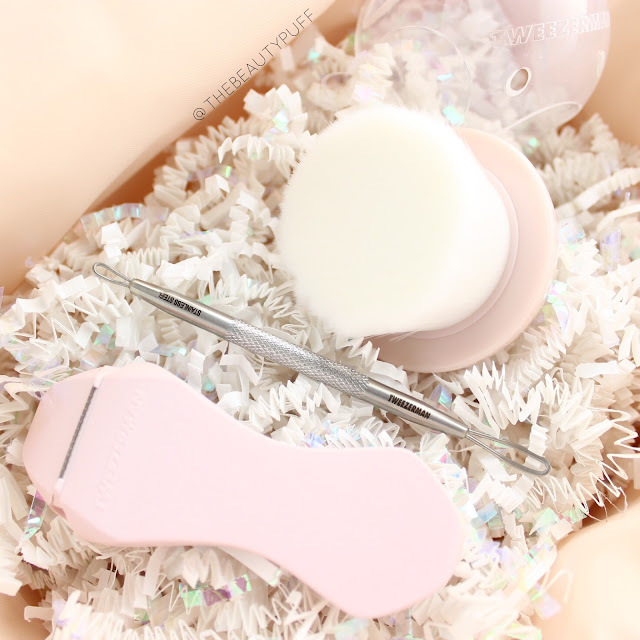 No Slip Skincare Tool | For anyone who suffers from blemishes, this tool is a must. The smaller side removes blackheads, while the larger side removes white heads. Gently slide the tool over the affected area for safe and sanitary removal. This tool really helps clear the blackheads on my nose... lovely right? Not only does my skin look and feel better, but my moisturizer absorbs better and makeup looks more flawless. Side note - always be sure to clean your skincare tool after use so it's ready to go next time! Bright Complexion Facial Dermaplaner | Who needs a dermatologist when you can have a soothing facial at home? This dermaplaner can be used in two ways. Use in a downward motion to exfoliate and promote skin renewal. Use in an upward motion to remove peach fuzz. Make sure your skin is clean, moisturized and slightly dampened before use. Each dermaplaner comes with replacement blades which should be switched out every three months. Use a maximum of once a week for a brighter complexion. This tool is really easy to use and you can literally see the dead skin on the blade once you're done using it! I love seeing instant results like that. I can't wait to see my skin improve so I can wear lighter makeup this spring. You can find the all new Tweezerman Skin Cleansing Tools on their website below! Also make sure to follow @tweezerman on Instagram so you don't miss their new releases!